The Rickettsiaceae are a family of bacteria. The genus Rickettsia is the most prominent genus within the family. 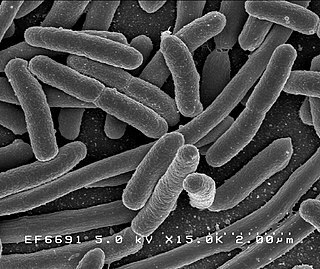 From this family, the bacteria that eventually formed the mitochondrion (an organelle in eukaryotic cells) is believed to have originated. Most human pathogens in this family are in genus Rickettsia. They spend part of their lifecycle in the bodies of arthropods such as ticks or lice, and are then transmitted to humans or other mammals by the bite of the arthropod. It contains Gram-negative bacteria, very sensitive to environmental exposure, thus is adapted to obligate intracellular infection. 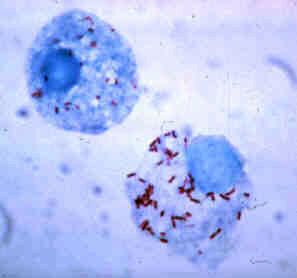 Rickettsia rickettsii is considered the prototypical infectious organism in the group. Family is one of the eight major hierarcical taxonomic ranks in Linnaean taxonomy; it is classified between order and genus. A family may be divided into subfamilies, which are intermediate ranks between the ranks of family and genus. The official family names are Latin in origin; however, popular names are often used: for example, walnut trees and hickory trees belong to the family Juglandaceae, but that family is commonly referred to as being the "walnut family". Conserved signature inserts and deletions (CSIs) in protein sequences provide an important category of molecular markers for understanding phylogenetic relationships. CSIs, brought about by rare genetic changes, provide useful phylogenetic markers that are generally of defined size and they are flanked on both sides by conserved regions to ensure their reliability. While indels can be arbitrary inserts or deletions, CSIs are defined as only those protein indels that are present within conserved regions of the protein. A sigma factor is a protein needed for initiation of transcription in bacteria. It is a bacterial transcription initiation factor that enables specific binding of RNA polymerase (RNAP) to gene promoters. It is homologous to archaeal transcription factor B and to eukaryotic factor TFIIB. The specific sigma factor used to initiate transcription of a given gene will vary, depending on the gene and on the environmental signals needed to initiate transcription of that gene. Selection of promoters by RNA polymerase is dependent on the sigma factor that associates with it. A spirochaete or spirochete is a member of the phylum Spirochaetes, which contains distinctive diderm (double-membrane) bacteria, most of which have long, helically coiled cells. Spirochaetes are chemoheterotrophic in nature, with lengths between 3 and 500 µm and diameters around 0.09 to at least 3 µm. Protein catabolism is the breakdown of proteins into amino acids and simple derivative compounds, for transport into the cell through the plasma membrane and ultimately for the polymerization into new proteins via the use of ribonucleic acids (RNA) and ribosomes. Protein catabolism, which is the breakdown of macromolecules, is essentially a digestion process. Protein catabolism is most commonly carried out by non-specific endo- and exo-proteases. However, specific proteases are used for cleaving of proteins for regulatory and protein trafficking purposes. One example is the subclass of proteolytic enzymes called oligopeptidase. The Aquificae phylum is a diverse collection of bacteria that live in harsh environmental settings. The name 'Aquificae' was given to this phylum based on an early genus identified within this group, Aquifex, which is able to produce water by oxidizing hydrogen. They have been found in springs, pools, and oceans. They are autotrophs, and are the primary carbon fixers in their environments. These bacteria are Gram-negative, non-spore-forming rods. They are true bacteria as opposed to the other inhabitants of extreme environments, the Archaea. The Chloroflexia are one of six classes of bacteria in the phylum Chloroflexi, known as filamentous green non-sulfur bacteria. They produce energy from light and are named for their green pigment, usually found in photosynthetic bodies called chlorosomes. 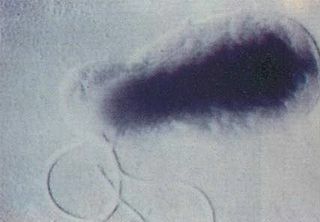 The phylum Bacteroidetes is composed of three large classes of Gram-negative, nonsporeforming, anaerobic or aerobic, and rod-shaped bacteria that are widely distributed in the environment, including in soil, sediments, and sea water, as well as in the guts and on the skin of animals. Bacteroidetes spp. are part of normal, healthy placental microbiome. Corynebacterium is a genus of bacteria that are Gram-positive and aerobic. They are bacilli (rod-shaped), and in some phases of life they are, more particularly, club-shaped, which inspired the genus name. Nocardia is a genus of weakly staining Gram-positive, catalase-positive, rod-shaped bacteria. It forms partially acid-fast beaded branching filaments. It contains a total of 85 species. Some species are nonpathogenic, while others are responsible for nocardiosis. Nocardia species are found worldwide in soil rich in organic matter. In addition, they are oral microflora found in healthy gingiva, as well as periodontal pockets. Most Nocardia infections are acquired by inhalation of the bacteria or through traumatic introduction. Chlorobium is a genus of green sulfur bacteria. They are photolithotrophic oxidizers of sulfur and most notably utilise a noncyclic electron transport chain to reduce NAD+. Photosynthesis is achieved using a Type 1 Reaction Centre using bacteriochlorophyll (BChl) a. Two photosynthetic antenna complexes aid in light absorption: the Fenna-Matthews-Olson complex, and the chlorosomes which employ mostly BChl c, d, or e. Hydrogen sulfide is used as an electron source and carbon dioxide its carbon source. Bifidobacteriales is an order of bacteria, in the subclass of Actinobacteridae. Fibrobacteres is a small bacterial phylum which includes many of the major rumen bacteria, allowing for the degradation of plant-based cellulose in ruminant animals. Members of this phylum were categorized in other phyla. The genus Fibrobacter was removed from the genus Bacteroides in 1988. The Streptomycetaceae are a family of Actinobacteria, making up to the monotypic suborder Streptomycineae. It includes the important genus Streptomyces. This was the original source of many antibiotics, namely streptomycin, the first antibiotic against tuberculosis. Fibrobacter succinogenes is a cellulolytic bacterium species in the genus Fibrobacter. It is present in the rumen of cattle. Beta glucans are its substrate of choice in the rumen and its products after digestion include formate, acetate and succinate. Fibrobacter succinogenes forms characteristic extensive grooves in crystalline cellulose, and is also rather readily detached from its substrate during sample preparation. ↑ Gupta, R. S. and Mok, A. (2007). Phylogenomics and signature proteins for the alpha Proteobacteria and its main groups. BMC Microbiology. 7:106. DOI:10.1186/1471-2180-7-106. ↑ Gupta, R. S. (2005). Protein signatures distinctive of alpha proteobacteria and its subgroups and a model for alpha proteobacterial evolution. Critical Reviews in Microbiology. 3:101-135. DOI: 10.1080/10408410590922393.